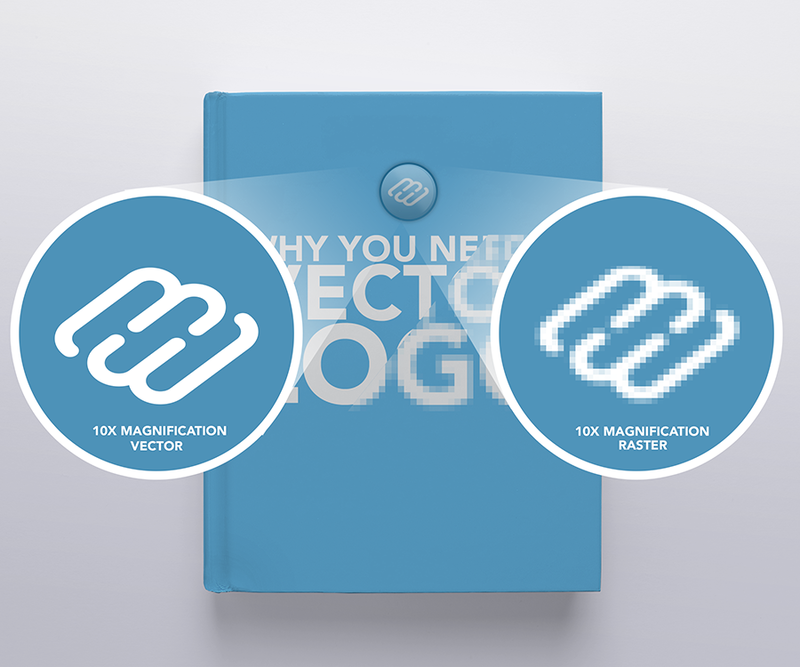 The value of a Vector logo boils down to two parts: flexibility and scalability. Vector logos are flexible because they can be output to just about any common Raster image format (jpg, png, gif, tiff, etc.). Vector logos are also scalable in size allowing them to be enlarged to fit the side of a blimp or reduced to the size of a business card without jeopardizing quality. Notice the quality of the Vector format is maintained as it’s magnified, whereas the Raster format looks terrible. Raster graphics can be scaled down in size and typically maintain their quality. Once you start increasing the size of a Raster graphic, the quality degrades dramatically and you will have a very blurry version of your logo. This is a common problem and is a critical reason to have your logo in Vector format. Whenever a Raster version of your logo is requested, use the Vector version to generate the output. This will ensure the absolute highest quality and accurate representation of your brand. EPS (Encapsulated PostScript): Adobe's EPS format is the most widely used Vector graphic format. It is the standard interchange format for the print industry, and is a well supported export format from Vector graphics software. Brands should always have their logos in EPS format. AI (Adobe Illustrator Artwork): Adobe Illustrator’s native format is AI which is a modified version of the EPS format. The AI format is fairly common, but is less universal than the EPS format. If you have an AI version of your logo, make sure to also have a version in EPS format to cover your bases. Raster images can be embedded in Vector graphics, but it completely defeats the purpose of having a vector logo. For example, a photograph can be saved inside of an EPS, and used as a texture or effect in a logo. This may look good in some situations, but eventually the brand will need to scale the logo larger than the original raster resolution and distortion will occur. It’s best to design smart, and stay within the capabilities of Vector graphics. Never embed images or raster graphics in your logo. Without a Vector logo the brand will eventually encounter a situation where their logo will fail, and it will be expensive, frustrating and time consuming to deal with. Solve the problem before you encounter it by making sure you always have your logo in Vector format.